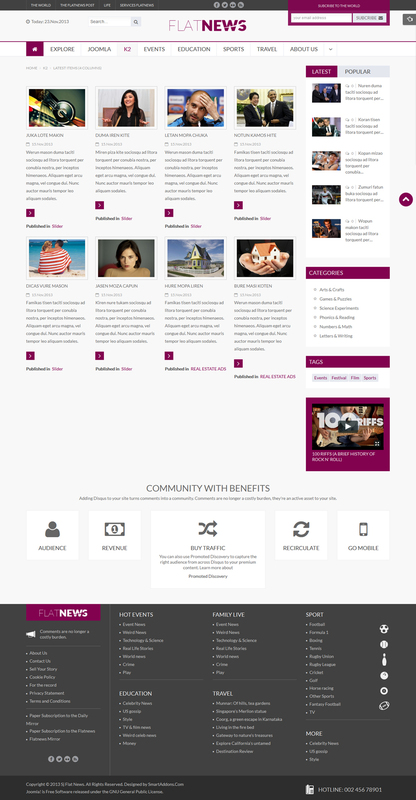 Flat SJ News - exclusive multifunctional template for joomla versions 3.h/2.5. Its developer is the studio SmartAddons. The template provides 7 color sets and 3 types of layout modules in the layout. This allows you to optimally suitable site structure and create a just such a design that is needed. Another significant advantage of this template - it support RTL spelling. It gives you the opportunity to use the site content in a broader range. Built-SJ Flat News on the resource to realize the excellent functionality, which is suitable for blogging resources, magazine and news portals, and of course corporate projects. Template developers used it full support multifunctional component K2, and moreover used a large number of custom extensions, such as SJ K2 Slider - for news show using transformation effects, the system Mega Menu - this is an excellent module for creating navigation system of any site. Template SJ Flat News working platform YT Framework. This framework allows you to add to the template full adaptability and features of the full site settings from administration panel. Website created on this template will look the same as on standard computer monitors and displays on mobile devices.